Over the past weekend, Felkerino and I met up with fellow D.C. Randonneurs Chuck, Crista, and George to ride the recently approved Road Less Travelled Populaire. 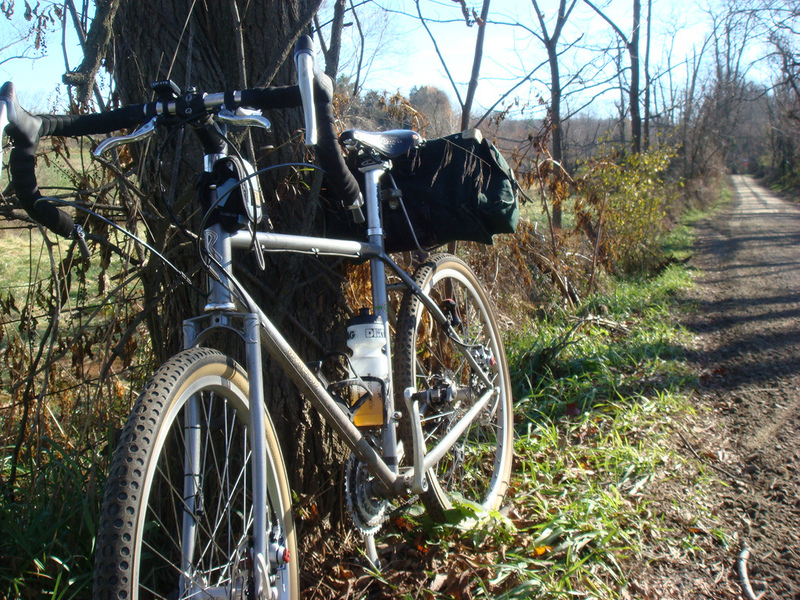 This ride, designed by George Moore, totals 130K/83 miles, with approximately 60 percent of featuring unpaved roads. 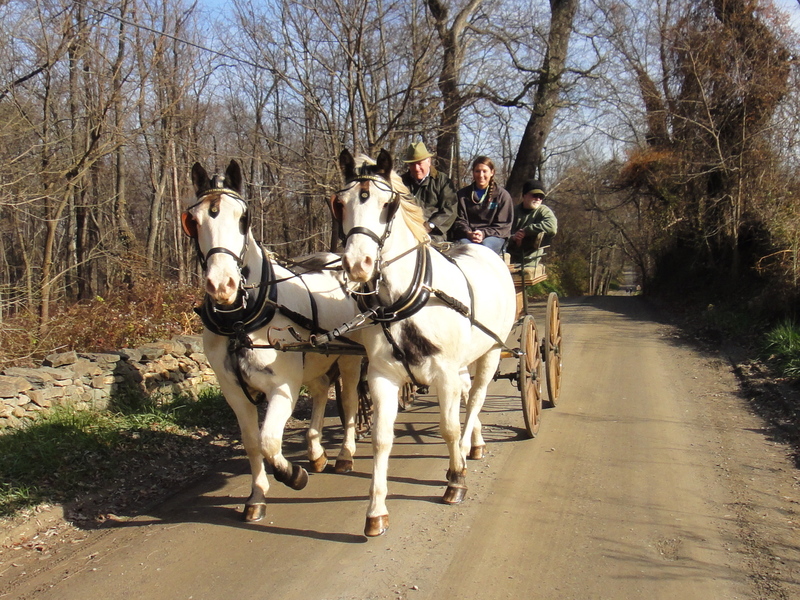 It starts in Haymarket, Virginia, and takes a blend of back roads and pavement to Purcellville, on to Middleburg (the heart of Loudoun County’s horse country), and back again to Haymarket. Felkerino and I thought a ride like this would be an excellent change of pace from the regular road riding we do. Because the course had so many unpaved sections, we decided to leave the tandem at home and ride single bikes. We readied up our 650B Rawland dSogns, threw some fatty rumpkin 40mm tires on the bikes, and headed out for a fun day in the country. I had a blast riding my Rawland. While the beginning and ending miles of the route were mellow, the bulk of the ride felt pretty much like a perpetual roller coaster. Overall, the route has over 6,200 feet of climb in 83 miles. Some of the climbs on the ride were steep, but with the Rawland’s mountain gearing I felt I could climb anything. Also, having done so much climbing on the tandem, the relative lighter weight of the Rawland made me feel speedy and strong. In reality, I was not speedy, but the Rawland made me feel like I was! The 40mm tires gave me extra confidence on the hard-packed or sometimes gravelly downhills, as did the disc brakes. The brakes are so responsive on this bike that I have to be careful to not grab them to tightly. A little bit will usually do. I had to pay extra attention on this ride, not only because I was steering for a change, but also because the road surfaces varied in quality and the patchy shadows cast over the roads in the tree-lined areas made the road more difficult to see. The minute I stopped paying attention I would inevitably dip my tire into a pothole. The leaves on most of the trees had fallen, and many of the bright colors of fall had given way to varying shades of brown. The route was still picturesque, but I can only imagine how much more stunning it would be if ridden earlier in the fall, or during the green of spring and summer. Felkerino and I did not race through this ride, but we did need to keep moving in order to finish within the mandated time limits. To see more pictures of what the ride offered, check out Felkerino’s photos here, and my small set here. Like I said, it was great fun. 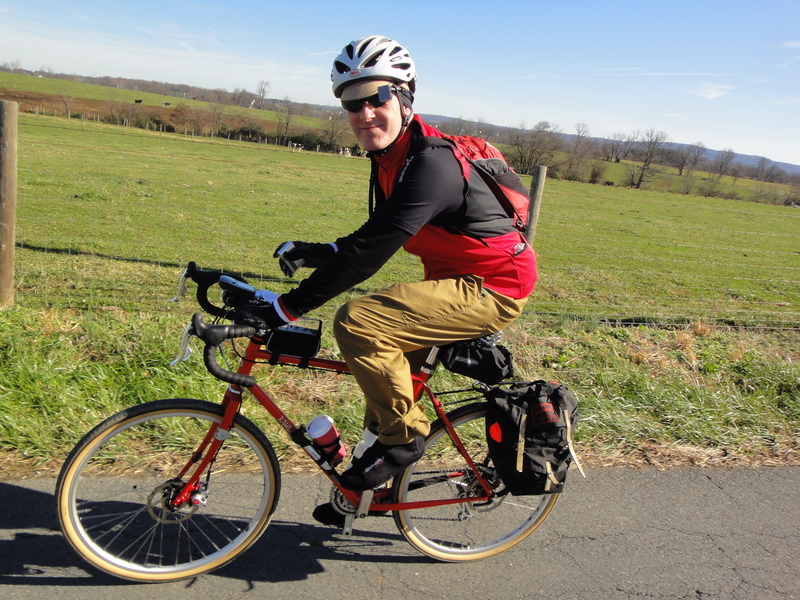 We launched relatively close to D.C., started in daylight, finished in daylight, challenged our legs with the ups and downs of the route, and saw lots of “new” lovely areas just beyond those familiar paved roads. This excellent day on our Rawlands left me wanting to do more dirt road rides. My frnned Charmaine and I decided to test a route for a get together with the Bike Friday Club of DC. 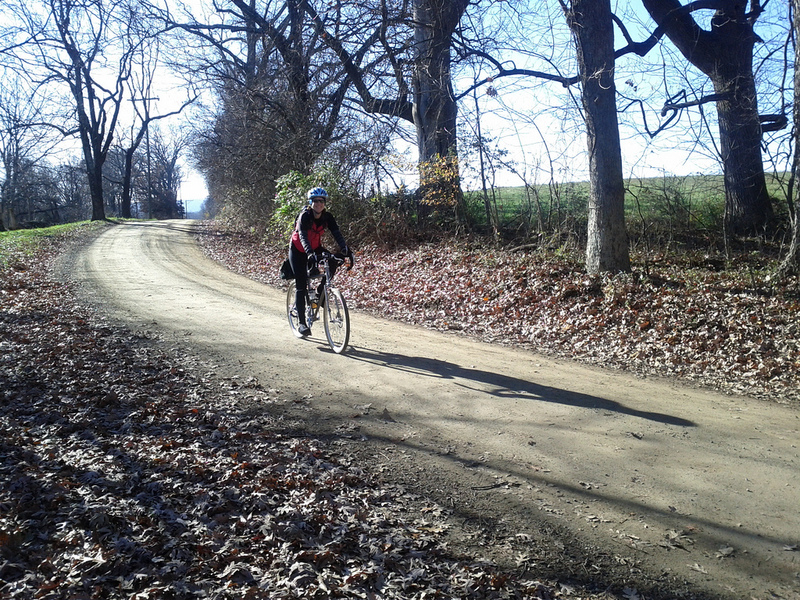 Not knowing some of the roads were unpaved, we came upon one that seemed to be pretty smooth. We climbed a steep hill and came down the back only to encounter washboard-like ruts across the road. I hit those ruts at high speed and bounced all over the road. I thought for sure I’d lose a few fillings! This area is just gorgeous for cycling, even with the occassionally iffy roads. I absolutely love riding this time of year, after the leaves have fallen. 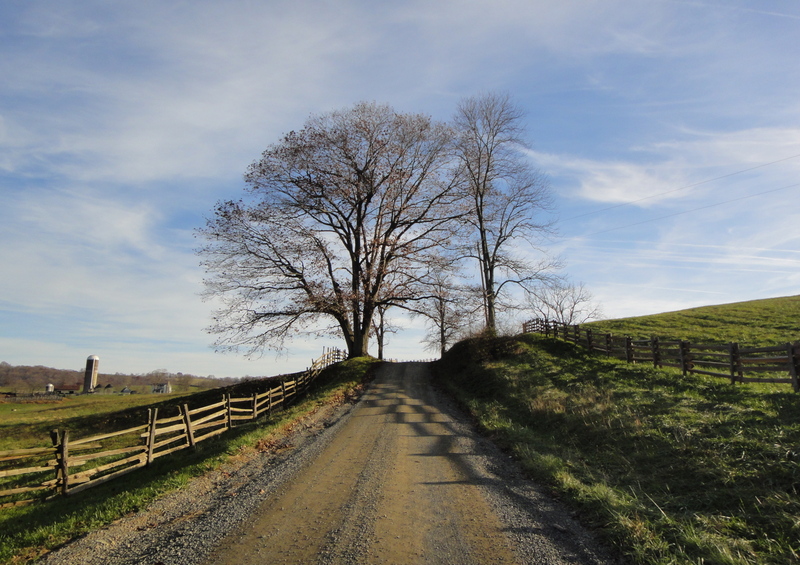 Bull Run Mountain Road — not so much! Bull Mountain Road was a surprise to me! I kept thinking we were at the top, and it just kept on going up.